Hosting email infrastructure and delivery offers email service providers (ESPs) little strategic advantage. Instead, operating end-to-end email delivery remains a resource-intensive function, with demanding human and infrastructural costs. On-premises infrastructure costs ESPs 25% more than cloud email delivery. 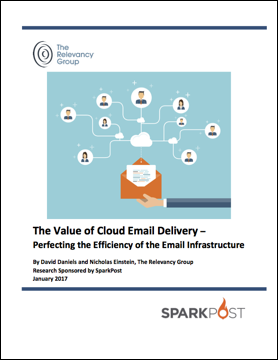 In absolute terms, cloud email delivery will save an ESP $100,000 annually for every 1 billion messages sent. ESPs and their customers together realize $3 million in upside annually for every billion messages moved to the cloud. ESPs that rely on cloud email delivery have higher deliverability rates than those utilizing on-premises solutions. Customer satisfaction with ESPs who employ cloud-based email delivery is higher. Download a complementary copy of this fact-based report from the Relevancy Group today.